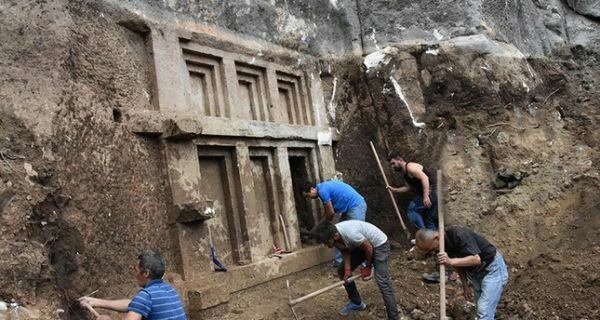 Workers carrying out excavations at private land near Köşkerler neighborhood found the ancient sepulcher and immediately informed authorities upon the discovery. Nuri Bilgiç, who was operating the construction equipment at the site called gendarmerie forces, who then sought assistance from Demre Lycian Civilizations Museum, Doğan News Agency (DHA) reported. Museum director Nilüfer Sezgin arrived at the site with a team of three archaeologists and eight workers, who launched excavations to unearth the sepulcher. The sepulcher measuring five meters in length and four meters in width, is very similar to the sepulchers discovered near the ancient city of Myra, Sezgin said. She noted that the sepulcher had a single chamber with three lids and was most likely swallowed by alluvium after the Myros streamlet overflew in the sixth century A.D.
Museum officials said that excavations will continue around the site to see if there are any other sepulchers or artifacts.